This is my little guy getting all big on me! He now weighs 3.5 pounds! Ha! 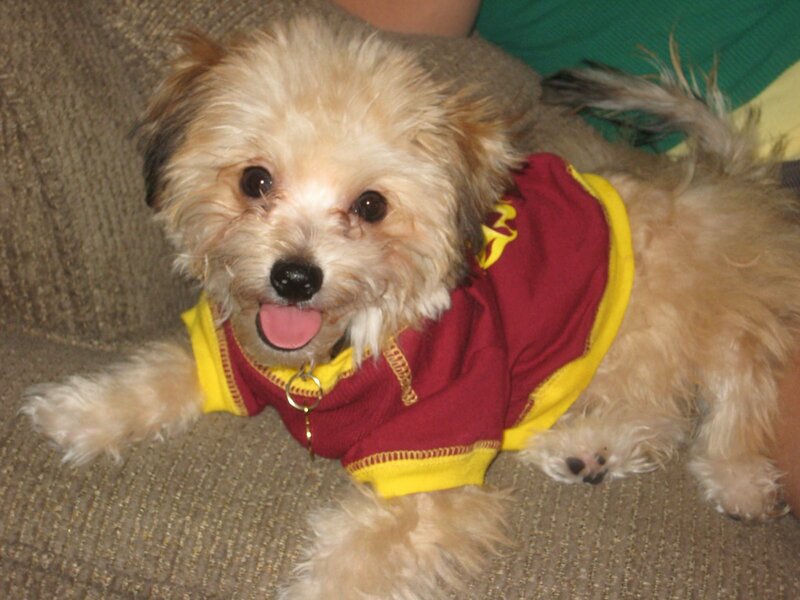 He is wearing his ASU shirt to support our team (even though the season isn’t going so well). I honestly can’t believe how much I love this little guy. What am I going to do without him next week? Ridiculously cute! What kind is he, and what is this fella’s name? He is SOOOOO adorable!! Isn’t it funny how we can’t think of having a dog for a long time, and then once we get one, we can’t think of being without them? When I went away last weekend I missed my dog like crazy. And now we’re supposed to go away AGAIN this weekend and I’m seriously having second doubts about leaving the dog. 3.5 is so little!! How big is he supposed to get? SO cute! I wish I had a little OU sweater my cat could wear!